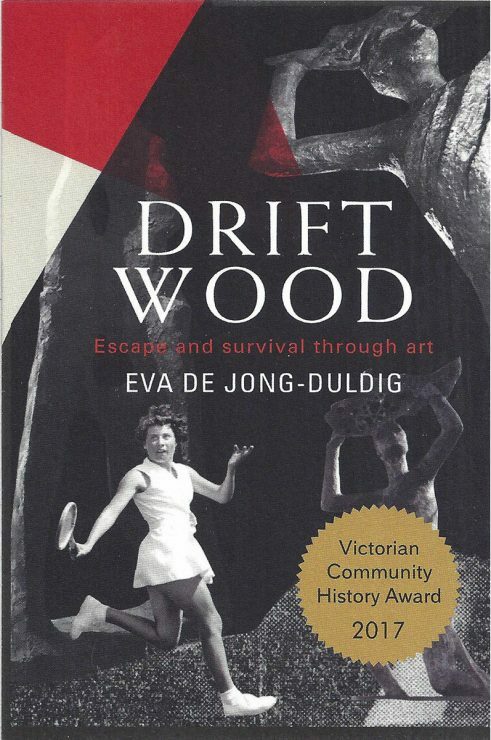 Eva de Jong-Duldig, Driftwood, cover image. 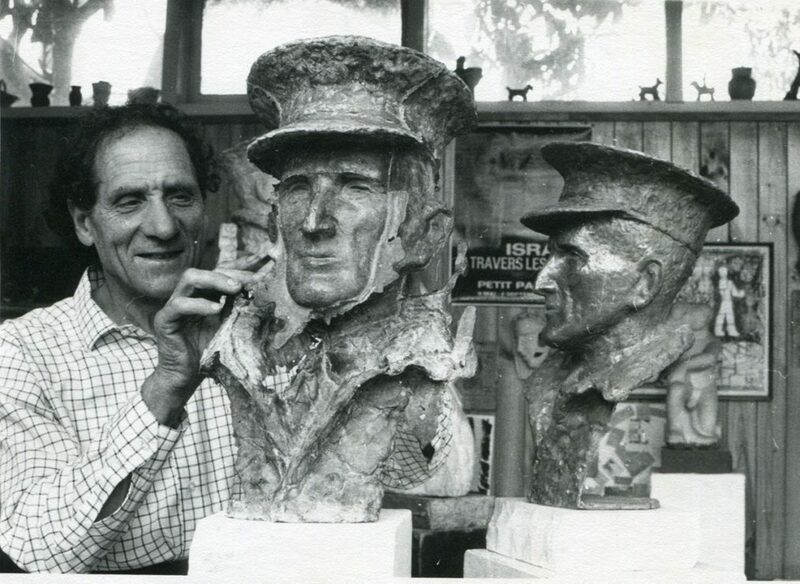 Karl Duldig with 2 bronze casts of Padre Charles Young, studio 92 Burke Road, East Malvern, 1970. In the memoir Driftwood, Eva de Jong-Duldig remembers her remarkable parents. Her father Karl Duldig was a Modernist artist, her mother Slawa Horowitz-Duldig, also an artist, invented and patented the folding umbrella. The entire family, including baby Eva, fled Austria in 1938 as the Nazi regime gained momentum. Eventually they ended up in Melbourne and in 1996 Eva transformed the family home into a museum, Duldig Studio. In the extract from Chapter 13 of Driftwood, reproduced with permission below, Karl has just joined the Australian army to secure the release of the family from a camp for ‘enemy aliens’ in Tatura, Vic, where they had been held since 1940. I had gone to St Kilda Beach with my parents to search for some mother-of-pearl shells, which they cut into tiny oval pieces to match those missing on the bottom two corners of the cabinet. These small shards were set into new black lacquer and the repair work was almost invisible, unless you knew exactly where to look. My parents rented a single room, with shared use of the kitchen and bathroom, in a boarding house at 18 Park Street, one of a number of similar one-storey Victorian terrace houses in this street. The accommodation was dark, dingy and scungy, but we were free to move around again so put up with these conditions. Travel was restricted to the metropolitan area and we had to report to St Kilda Police Station once a week. I did not like my new home, where I was confined to a small room and an uninviting backyard. It was in stark contrast to the Camp where I could wander everywhere alone or play with the other children. Karl put up some of his drawings and masks around the walls, but with only one small window letting in meagre light it was still very depressing. 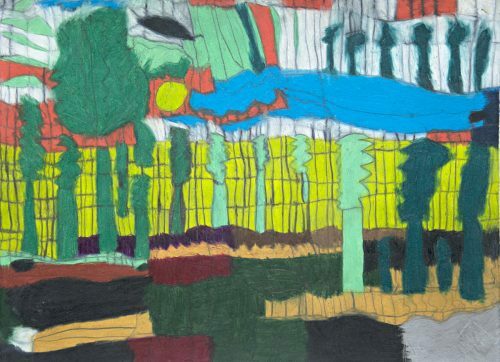 When my father had leave from Army duties, we explored our new neighbourhood – shopped in Fitzroy Street, walked in the nearby Catani Gardens, clambered along the Upper and Lower Esplanades and wandered along the beach or to the end of St Kilda Pier. Karl Duldig and Eva, 18 Park Street, St Kilda, 1942. Photo: Karl Duldig. Karl settled into Army life as best he could. The first week or so, he slept on the stands of Caulfield Race Course and then the AEC bivouaced at Camp Pell in Royal Park, near the Royal Children’s Hospital. The men of the 8th Employment Company worked on the wharves and railways shifting supplies and were, in effect, labourers in uniform. Karl became very tired and preferred to be assigned to kitchen duty where, instead of peeling the potatoes and throwing them in a bucket for the cook, he selected the largest ones and, using his paring knife, carved them into small figures. After these figures were cast in plaster, he gave them as gifts to the officers; however, three of these small sculptures were brought home. The ‘eye’ of the potato from which it was originally carved is still clearly visible on the head of one of these carvings. Karl Duldig, Crouching, carved in the Army from a potato, 1942. Captain Broughton, the Commanding Officer of the AEC, organised some materials and suggested that Karl design a new logo for the Australian Forces. Karl modelled a rectangular bas-relief profile of a soldier’s head, complete with the slouch hat and sword emblem, superimposed over a map of Australia. Broughton submitted the plaster cast for consideration by the authorities, but there was no feedback. Edward Renata Mahunga ‘Tip’ Broughton was a veteran of the Boer War and a decorated veteran of the First World War. A New Zealander, he was of mixed Maori (he was descended from a Maori chieftain) and European ancestry, one of only two ‘coloured’ officers in the Australian Army. He had experienced discrimination on racial grounds and maybe this was why he went out of his way to understand the motley group of soldiers under his command – the AEC was the only Australian military unit made up entirely of foreigners. Karl modelled a portrait of Captain Broughton and when it was completed Broughton commissioned a bronze cast. Karl Duldig, Captain Broughton, 1942. Collection: Australian War Memorial. At Royal Park, with a tent as a studio, Karl completed two other portrait busts. The first was commissioned by an American officer, Captain Skrzecka, and the second was of Captain Padre Charles Young. Padre was the Army chaplain to the AEC and he also visited us in Park Street. It was easy to see why Karl liked him, as his friendly, jovial disposition was infectious. After Padre’s death, his daughter, Nancy, commissioned a bronze of Padre’s portrait from Karl. The first cast was faulty – there were holes in the bronze and in other places the bronze had leaked out from the mould, making the bust look like a surrealistic impression of a battered, war-ravaged face. Joe Lemon, the founder, said that he would melt it down and recast, but Karl said he liked it and would keep it. It became an icon for us and stood for a long time on a cairn of stones in Mt Eliza. We called it Lest We Forget. Driftwood is available from Australian Scholarly Publishing and the Duldig Studio store. 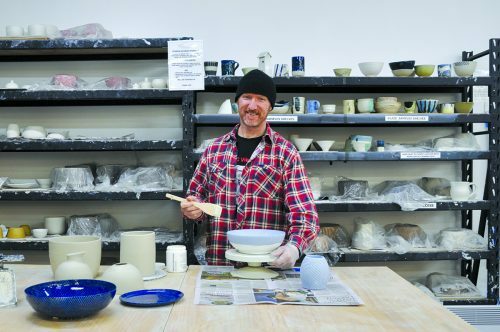 Having taken a quiet back seat for more than a few years, ceramic art is experiencing a welcome resurgence. 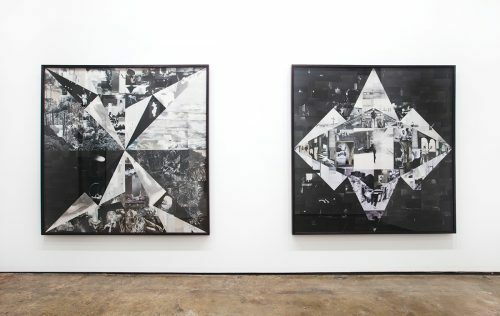 In her solo show Tertium Quid (loosely translated from Latin as ‘the third unknown’) O’Neil presented four large collages assembled from found photographic images.